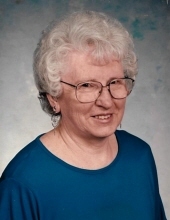 Margaret Joyce Carley age 90 of Richland Center passed away on Friday, November 30, 2018 at Pine Valley Community Village. Joyce was born on February 10, 1928 in Wauwatosa, WI the daughter of Joseph and Mollie (Starrett) Stevens. She attended Sextonville Grade School and Ithaca High School. Joyce worked numerous jobs among which was working at Sextonville Gardens with her mother and step-father before her marriage to Richard H. Carley on March 30, 1953. Joyce took care of her home, children and garden until the children started school. She then worked at O’Bryan Brothers for 28 years until her retirement in 1990. She was content to enjoy her family and home. Her hobbies included camping, crocheting, crafts and reading. Joyce is survived by her husband, Richard H. Carley, 2 children, Sherrie (Ben) Biser, Richard N. Carley, a son-in-law, Larry Luxton, a step-daughter Laura (Dennis) Benson, 12 grandchildren, 23 great grandchildren, many great great grandchildren, step grandchildren and spouses, a half-sister, Donna Rose, several nieces, nephews, cousins and many friends. She was preceded in death by a daughter, Sandra Luxton, her mother Mollie Starrett Stevens Ingmire, her father, Joseph Stevens, her step-father, Nathan Ingmire, step-brother Earl Ingmire, step-sister, Marie Klitzke, 4 aunts and their spouses, an uncle and his wife and 2 great grandchildren. A private family graveside service will be held at the Sextonville Cemetery at a later date. Memorials may be made to G.R.A.C.E. Online condolences available at www.staffordfuneralhomes.com. The Stafford Funeral Home is assisting the family with the arrangements. "Email Address" would like to share the life celebration of Joyce M. Carley. Click on the "link" to go to share a favorite memory or leave a condolence message for the family.